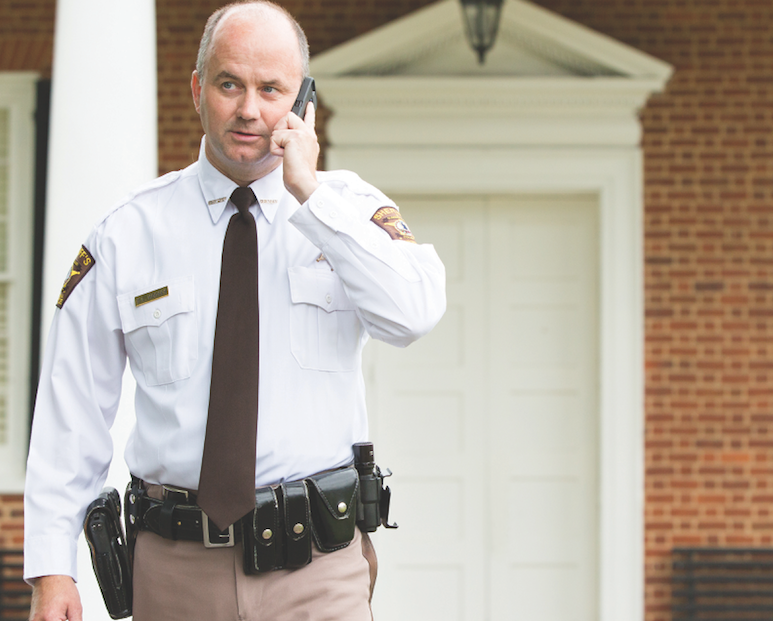 Cumberland County Sheriff Darrell Hodges ’07 takes a compassionate approach to law enforcement. They wear the uniforms of the state police, county sheriffs, urban patrolmen and conservation police officers. Across the commonwealth and beyond, Longwood alumni are pursuing their commitment to citizen leadership through service to law enforcement. What they share is a devotion to the communities they serve, and a keen appreciation for how their Longwood education provided them perspective and balance, and prepared them for the deeply human and challenging work of keeping their fellow citizens safe. 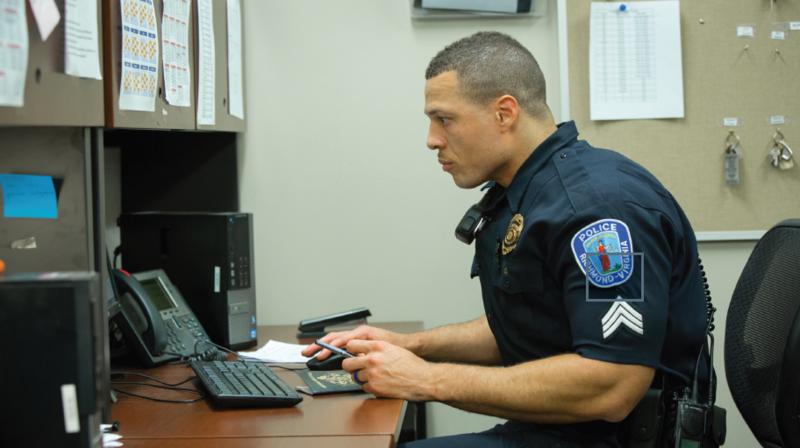 To be sure, training for a law enforcement career requires plenty of hands-on skills— knowing the law, procedures, firearms training and so forth. But the most essential tools are those of communicating—listening, analyzing, persuading. These, it turns out, are precisely the skills that are the focus at Longwood, with its small classes, residential learning community and the strong foundation in the liberal arts and sciences running through the curriculum of even its preprofessional programs. 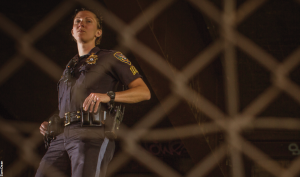 “A big part of the job is giving people a chance to talk, giving them a voice,” said Jessica Wilkerson ’06, a newly promoted sergeant in the Roanoke Police Department, who studied community health education at Longwood. Before assuming new duties in April, Wilkerson investigated physical and sexual abuse of children. These are particularly challenging times for law enforcement, and the ability to build trust has never been a more important part of the job. For many Longwood alumni in the field, it’s a critical part of the job. Case in point: Jay Louden ’01, who graduated from Longwood with a marketing degree and currently is a sergeant in the Richmond Police Department. Sgt. Tim Brennan ’84, who serves the community of East Norriton, Pennsylvania, a Philadelphia suburb, believes that public trust in law enforcement remains solid for the most part. How an officer treats people has always been a crucial part of the job and remains so, he said. 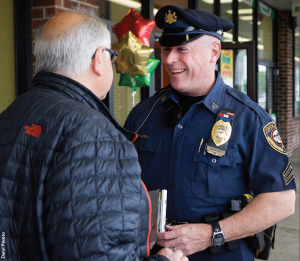 Sgt.Tim Brennan ’84, of the East Norriton (Pennsylvania) Police Department, believes in treating the public with respect. The most important “weapon” at a police officer’s disposal, the officers say, is the ability to communicate—which is much more involved than just talking. That’s certainly been the experience of State Trooper Travis Lewis ’10, whose father also was a state trooper. Working out of Amherst County near Lynchburg, Lewis, who earned a degree in sociology, enjoys the conversational part of his job. Longwood prepared Lewis in another way as well. “I can write one heck of a police report because of the papers I wrote there,” he said with a laugh. Word power—both in written and spoken form—also is a big part of Brennan’s day-today strategy. “You have tools on your belt, but your most important tool is your mouth,” he said. “Some people can talk a jumper off a bridge. On the other hand, some people who don’t know how to communicate could start a fight with a nun—those are the people who get you in trouble. A lot of people have a public speaking problem; you can’t have that as a police officer. The two most important attributes are presence and verbal command. You have to be confident with what you’re saying, and you have to deliver your message. “My teaching degree at Longwood set the table for me to be very successful here,” he said, adding that his written reports benefit from his college education every day. The people and communications skills a Longwood education instills come in handy no matter what corner of law enforcement officers occupy. For Jessica Whirley ’04, M.S. 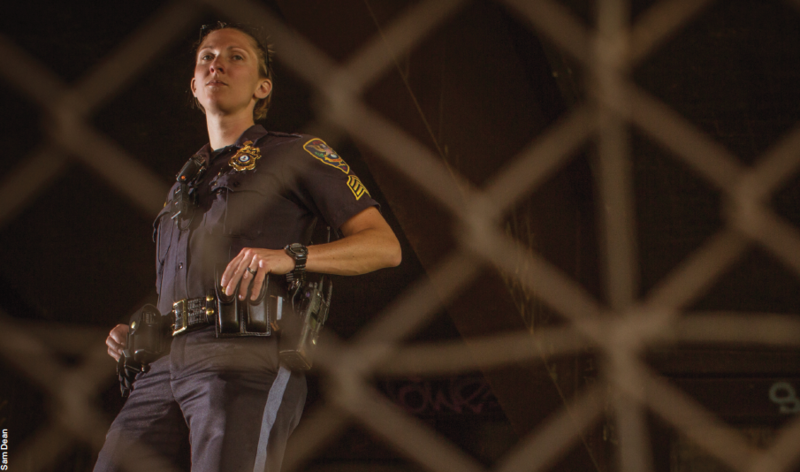 ’06, her interactions with hunters, fishers and boaters in Prince Edward County, where she is a senior officer with the Virginia Conservation Police, provide no shortage of challenges. Despite Whirley’s approach, her encounters can become tense—most of the people she interacts with have a firearm, some have been drinking and “nine times out of 10, you’re by yourself,” she said. Once, after checking the hunting license of an armed Buckingham County hunter whose behavior raised her suspicions, she ran a criminal check on him and discovered he was a convicted felon. That meant, unless he had regained his firearm rights, he was not allowed to possess a firearm—an arrestable offense. She agreed to his request to park his truck at the next pull-in, where she encountered a hostile crowd of at least 40 of the man’s friends— and his five sons. “The crowd surrounded the front of my vehicle and became very aggressive verbally. The sons were screaming at me, ‘You’re not taking my daddy in.’ It was nerve-racking,” said Whirley, whose degrees are in sociology and criminal justice. But she successfully arrested the man and took him to the magistrate at the Buckingham sheriff ’s office, then to Piedmont Regional Jail. 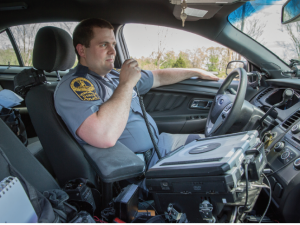 “A lot of people will say, ‘You can’t write a ticket; you’re just a game warden.’ My response is, ‘Yes, I can, and we’ll handle it in court.’ We can enforce any law, not just game laws, in the state of Virginia,” said Whirley, who, like other conservation police officers, carries a gun, sometimes does undercover work and graduated from a 29-week police academy. She was named 2015 National Officer of the Year by the North American Wildlife Enforcement Officers Association last August, the first woman and only the third Virginian to receive the award. Because Lewis works in the county where he grew up, he has had to give speeding and DUI tickets to people he knows. Let’s just say my list of friends has gotten shorter,” he said. And drivers he stops are sometimes less than cooperative. Once, after Lewis freed a drunk driver from his seat belt after he hit a tree—the man’s blood alcohol level was four times the legal limit—the driver took a swing at him (he missed). Others try to get away. “I have gone as fast as 131 miles per hour—the fastest my Crown Victoria can go—while chasing someone. You have to keep calm—it helps to take a couple of deep breaths,” Lewis said. In Wilkerson’s work as a member of the Roanoke department’s Tactical Response Team—the equivalent of a SWAT team— a few deep, calming breaths also might help. The team responds to “high-risk situations such as barricaded subjects, hostage negotiations, and arrests and search warrants where there’s a threat of violence,” said Wilkerson, the only woman on the 26-member team. She has gone on more than 15 calls since joining the so-called “tac” team in May 2014, including one early one April morning in nearby Vinton. A man with a history of violent incidents had barricaded himself in an acquaintance’s home at 7 the previous evening after a car chase that began when police tried to arrest him on an outstanding warrant. When an interaction becomes contentious, officers agree it’s important not to take it personally. Often officers are doing more than listening— they’re making contributions to their communities that go beyond their job descriptions. 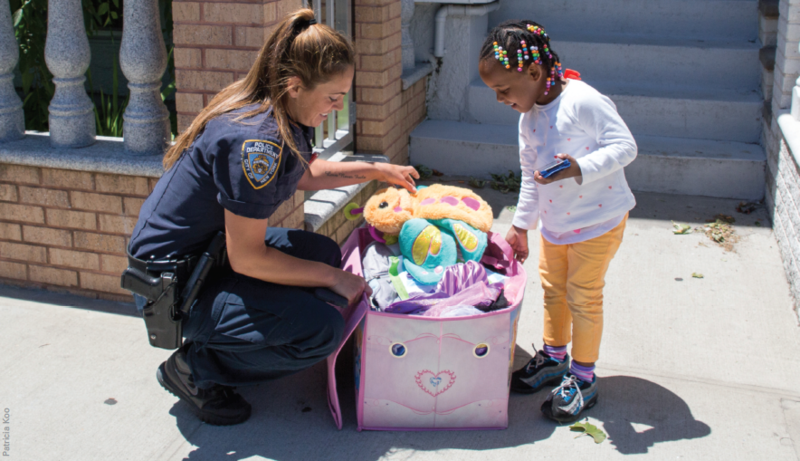 New York Police Department officer Valerie Cincinelli ’06, a domestic violence officer, calls kids her ‘soft spot.’ Here she is delivering clothing and toys to Kadocia Pierre, a client in the Ozone Park neighborhood in Queens, New York. Last Christmas Eve, Valerie Cincinelli ’06 and other members of her domestic violence unit in the New York Police Department conducted a toy drive in which they delivered toys to kids’ homes. They’re planning to have another toy drive this year, and Cincinelli also has donated clothes and strollers to the children of the adults she sees in her work, many of whom are immigrants living in “harsh, almost unimaginable” conditions. Hodges and his deputies take 65 needy kids Christmas shopping every year, with the money they spend—about $100 per child— coming from fundraisers or their own pockets. Because Cumberland County is home to many senior citizens, they take firewood to older folks and often phone them. If there is no answer within 30 minutes, they go to the person’s home. The officers don’t expect coverage on the evening news for these efforts, though they admit it would be nice. “The good cops never seem to get news coverage,” said Louden. So when recognition does come, it is all the more meaningful. “I was in a Wawa while on duty in late 2014 or early 2015,” said Louden, “and a lady came up to me and said, ‘Can I hug you? I just want to hug you and say thank you.’ This was at a time when police officers were being trashed in the news media, so it was nice to know that not everyone is opposed to the police. At the end of the day, these officers simply enjoy what they do.